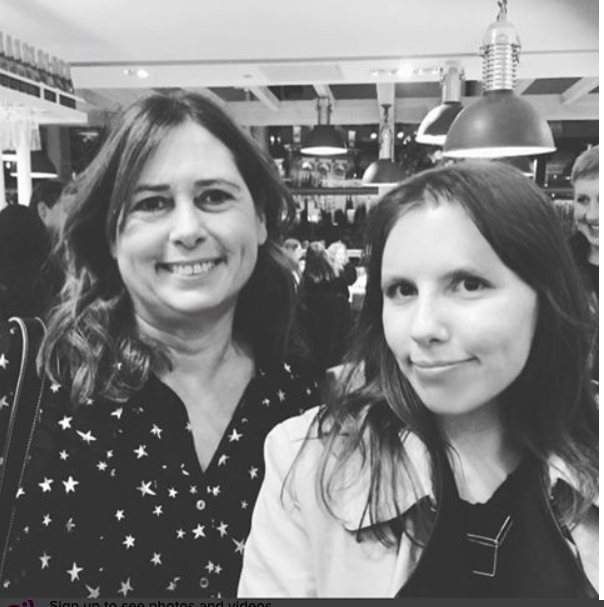 13th October 2016, was an evening of such inspiration and insight as we attended Alexandra Shulman in conversation with Jo Ellision, Financial Times Fashion Editor. Meeting Alexandra in person from my perspective was different than I have seen from other Vogue editors (e.g. Anna Wintour is known for her bob, sunglasses and being influential). That is kind of a celebrity or personal brand of recognition in some way. Alexandra showed to be down-to-earth, knowledgeable about the ever changing of British Vogue amongst setting aspirational standards throughout. In comparison to the recent BBC 2 documentary ‘Absolutely Fashion: Inside British Vogue.’ Where Alexandra had been portrayed to be someone who is deemed as lonely. “I wanted the result to be something which I thought would be interesting, to show the magazine as the magazine is and I think it did that. I don’t particularly like the way it showed me but it showed a lot of other things in the magazine. I never thought it would be that kind of gentle, more artistic thing, I knew it was going to be more plonk, plonk, plonk. Maybe not quite as much as it came out.” Said Alexandra. “Richard the narrator followed us around for 9 months and the documentary was 2 hours so the edit was enormous. I was surprised by what he chose to put in and what he chose to leave out, I thought it was pretty representative of Vogue, I didn’t think it got across the kind of humour in the office, it’s a lighter place than he portrayed it as. But at the same time, I think he was trying to make it sound like it wasn’t this foolish world of fashion. I was pleased about that but there were a lot of things I wasn’t pleased about." Throughout the evening various subjects were discussed whilst, there was a running theme of reflection towards the changes been faced by the magazine and fashion industry at this current time. Alexandra reflected how running Vogue during, the early 90’s was completely a different time of interaction and how people saw fashion then. “In 1992 I had 12 issues a year of magazines to produce and that was basically it, apart from fashion shows and you were a brand ambassador but you didn’t have any digital, didn’t have any of the 24-hour news, the video, a festival or events like Fashion Night Out. It was a much smaller fashion network to engage in as well. There was very little competition in 1992 and now there’s a lot. Not only magazines but newspaper fashion supplements and obviously online commentary with bloggers and there are even the brands and the retailers who produce their own magazines, so I guess the biggest challenge for me at the moment is that our slogan is ‘Vogue Fashion Bible’ and we don’t just get to be a Fashion Bible and sit there, we’ve got to keep making sure we’re worthy of that title. Alexandra throughout discussed, how the magazine is continuing to grow through the different new audiences being created through the vast circulation of online media and technology. In which resulted in the loyal Vogue readers around me, to hear such positivity that Vogue is a magazine that will not suffer from being outdated. In return, it is to be a magazine that is continuing to grow through the different platforms to stay relevant, fresh and allowing its voice be heard amongst the competition. 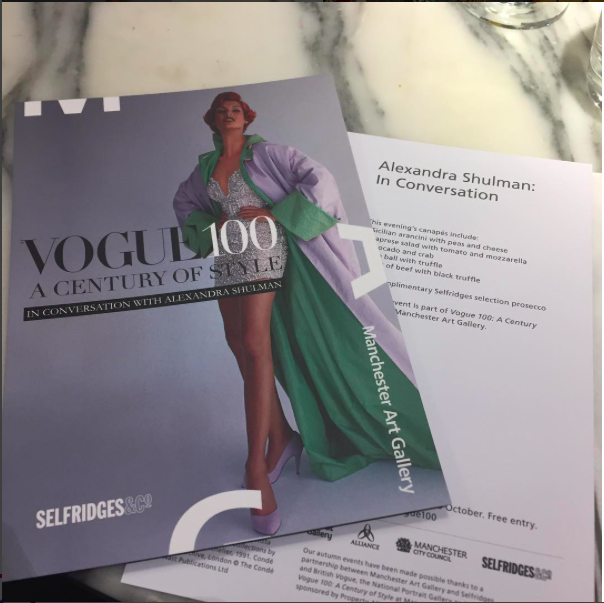 2016 being the year British Vogue’s 100th birthday Jo posed more questions of reflection to Alexandra on her views of the anniversary issue and magazines celebrations. “The Birthday celebrations were 4 years in the planning so it had been quite a build-up. The 100th Year had to be a year that made people want to buy the magazine, a year that made people feel that Vogue was part of the future, not the past. I decided to keep a diary of the process, of the whole year. Said Alexandra. As the evening of discussion drew to a close there was one question in which was regarding, how to find the next good idea. I purpose is it a question one cannot simply reply fully enough to understand. Keeping the standards of aspirations Alexandra had set throughout, to those including myself who want something to take away she mentioned one piece of advice “Is that you are good as the next thing you do as well”. In relevance to the future of Vogue Alexandra looked to be focusing on the digital arm of the magazine of how it can sustain itself within up and coming online publishing market. Overall it was an insightful evening into the past and future of British Vogue.